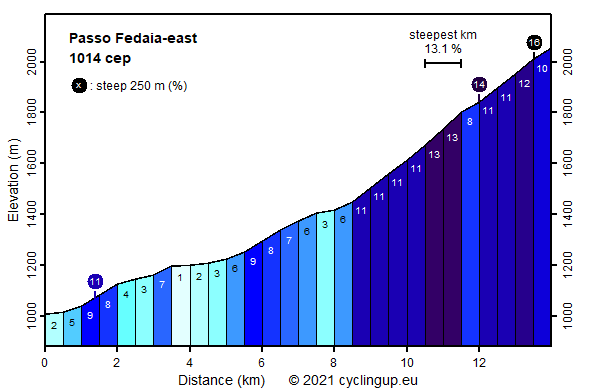 The ride from Caprile to the Passo Fedaia is one of the most famous climbs in the Dolomites, thanks to its second part. After a little over eight kilometers, after a tunnel just before the village of Malga Ciapela, hell breaks loose. The road turns right and, in the next three kilometers, it runs almost straight to the north. The average slope of this section measures 12%. The steepest kilometer, this is the last of the three, ending where the almost straight road turns left, has a gradient of 13.1%. It is hardly visible that the road is that steep because there are no curves and almost no trees on both sides of the road. After this utterly steep section, the remaining two and a half kilometers to the pass are a little easier although the slope still measures 8-12% and although there are some extremes in this part (14 and 16% for 250 meter strips). Unlike the second part of the climb, the first part is relatively easy. Here the slope varies enormously (1-9% for the 500 meter intervals). The road passes through the green Val Pettorina with high mountains all around, including the Marmolada (3343 m), which lies in the direction of travel. As explained before, the ride gets hard where the road bends to the right into a side valley.